Ryan the TV Star – I am in my head. 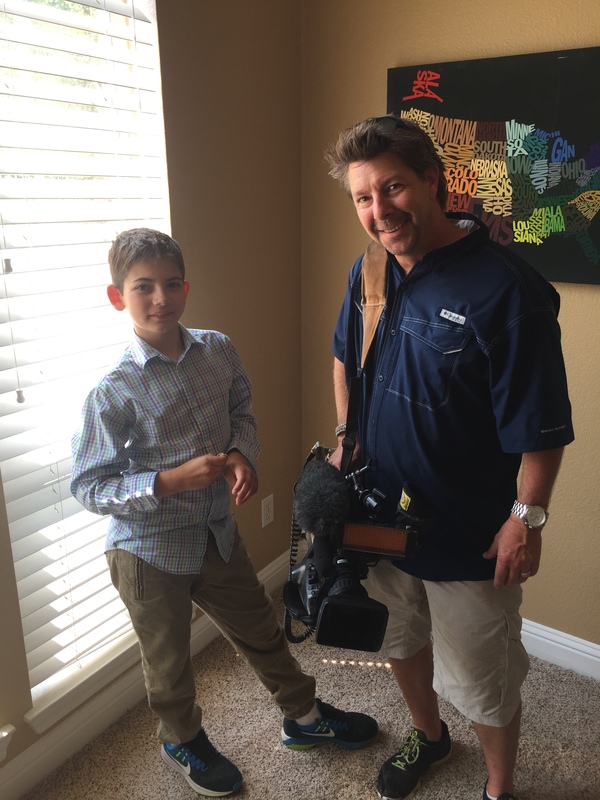 Update: Ryan’s story aired tonight and you can find it here. We had a big day in our household on Tuesday. 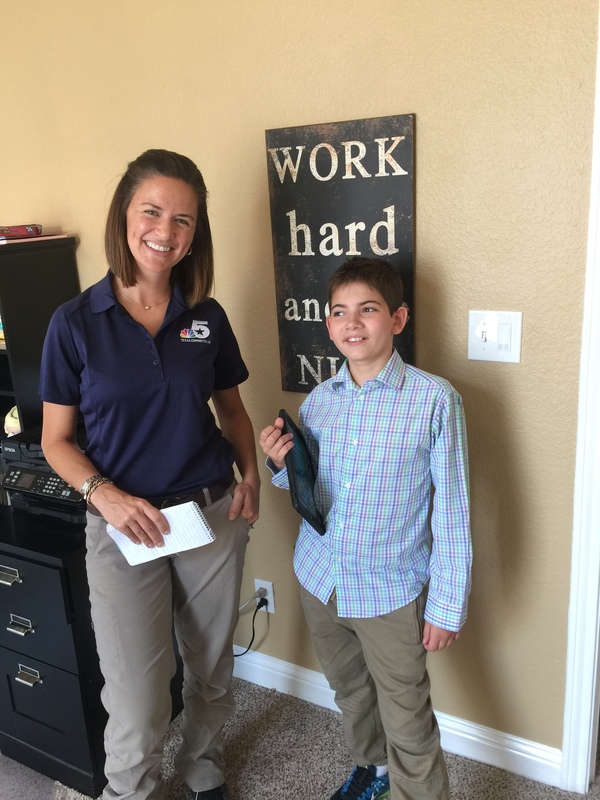 Kristin Dickerson of NBC 5 in the DFW area came to our home to learn all about Ryan and our blog. 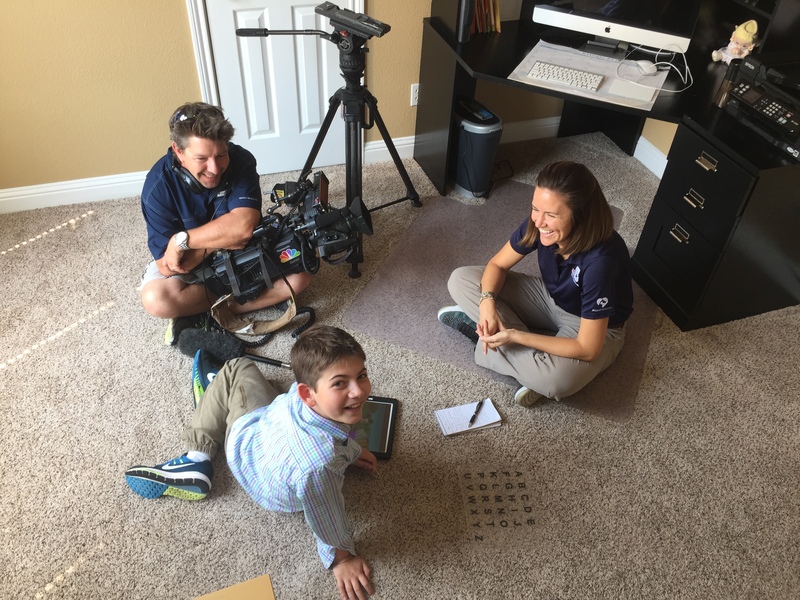 Ryan will be featured as a part of a series called “Courageous Kids” which is about 6 stories of local children with various special needs who have made incredible accomplishments. Ryan’s segment is scheduled to air on Tuesday, September 19th during the 6:00 pm news broadcast and will be about 2.5-3 minutes in length. So for the first time, Ryan the Interviewer became Ryan the Interviewee. Kristin and Mike Heimbuch, photojournalist, arrived at 10:30 am and we sat down and talked for a bit. Ryan was very excited about the opportunity and asked if we could get started. We started in our classroom and Kristin asked Ryan some questions. 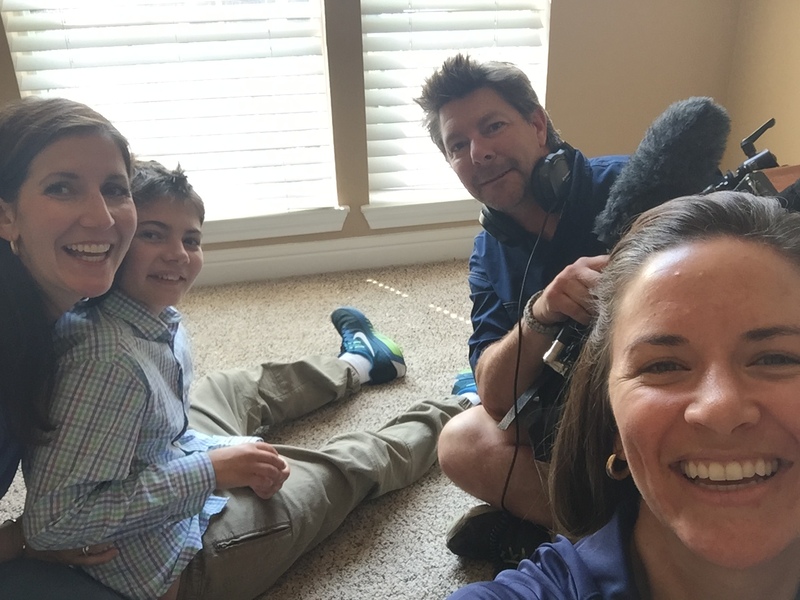 Without spoiling too much of the actual segment, Kristin asked Ryan about the blog, what it was like before he could communicate, and what he wants the parents of children with autism to know. After a while, we took a break and Mike captured some footage of Ryan, Freckles, and me walking outside. We then spent some time reading in Ryan’s room (we do that everyday for multiple periods) and they recorded that too. Throughout this whole time, Ryan answered questions using his letter board. I could tell he was getting tired as he began to rest his elbow on my leg when he was pointing. It is tiring to spell out all of your thoughts letter by letter. Kristin then wanted to get my perspective on things, so I sat with her for an interview. LIKE TO THINK IT SHOULD BE RYAN THE TV STAR. So I typed that in. He also mentioned TOO REALLY READY TO BE ON TV. IT WAS REALLY AWESOME. IT REALLY LIVED UP TO MY EXPECTATIONS. DEARLY I AM SO GRATEFUL FOR THE OPPORTUNITY. Then the tables were turned. Ryan was back to the interviewer. Can you tell he loved interviewing them? Ryan and Mike. They got along so well! Mom taking the shot from above. Kristin and Ryan, both skilled interviewers! Ryan was amazing. I am always proud of him, but to be 10 years old, and to have handled the pressure with such ease, I was in awe of him. DEARLY LOVED IT MOM. MIKE IS FEELING TOO MUCH REALLY LIKE MY FRIEND NOW. EVEN THOUGH I WAS NERVOUS, HE PUT ME AT EASE. When I asked Ryan about the camera, Ryan replied CAMERA WAS DISTRACTING AND I GOT A LITTLE FRUSTRATED BUT I GOT MY POINTS ACROSS. KRISTIN IS PRETTY AND NICE. SHE CARES ABOUT MY STORY. THE QUESTIONS WERE GOOD. TOO LOVING THAT SHE THINKS THAT I AM A GREAT SPELLER. BOUND TO STAY IN TOUCH WITH HER. CARE TO THINK I AM HELPING OTHERS BY PUTTING MYSELF OUT THERE. I AM FINDING AREA OF EXPERTISE IS MOSTLY ADVOCATING FOR THOSE WHO DO NOT YET HAVE A VOICE. I asked Ryan how he was able to handle the pressure and his nerves. MY NERVES ARE IN CHECK BECAUSE I AM TOO WANTING TO DO IT. I mentioned to him that there are other RPMers who can communicate like him but that their nerves would likely hinder them from doing things like this or speaking in front of a group. DIVERSITY IN ADVOCATING IS GOOD. TOO THINKING THAT OTHERS CAN HELP ALWAYS IN OTHER WAYS BY WRITING AND RECORDED LESSONS. CAN WE THANK MIKE AND KRISTIN? I told him that of course we could include that. I asked if he wanted to have a viewing party when the segment aired. Mike got this shot of Ryan, which really captures who Ryan is. I can’t wait to see your segment on TV. I am so proud to know you and your family. This was a very big deal and I am so glad you enjoyed it. Very special. This is truly amazing. Ryan, you seem wise beyond your years and your bravery is going to do good things and help lots of people. I stumbled across your blog after watching you meet Mickey Mouse. After reading a few blog posts, I know that you’re a young man who is going to leave a huge positive mark on this world and I’m rooting for you! I live in Louisiana so I won’t be able to see your big TV moment but I hope to come back and see it here! So cool! Was great to see you today at the visitor center downtown. Pingback: Ryan’s Birthday Celebration – I am in my head.